SHINE is certified to IPC/WHMA-A-620. IPC-WHMA-A-620 standards represent an important part of SHINE’s commitment to quality. Our manufacturing center in Adams, Massachusetts is WHMA/IPC620 certified and our manufacturing and quality staff are also certified to IPC/WHMA-A-620. The IPC/WHMA-A-620, Requirements and Acceptance for Cable/Wire Harness Assemblies is a joint project of IPC (Institute of Printed Circuits) and WHMA (Wire Harness Manufacturers Association). Originally released in 2002, IPC/WHMA-A-620 has become the industry standard against for quality. Today, IPC/WHMA-A-620 is the most important process, materials, and inspections standard for the cable assembly and wire harness industry. SHINE’s IPC/WHMA-A-620 certification demonstrates our commitment to continuous improvement of product, quality and reliability. SHINE also has a Certified IPC Trainer (CIT) on-staff. 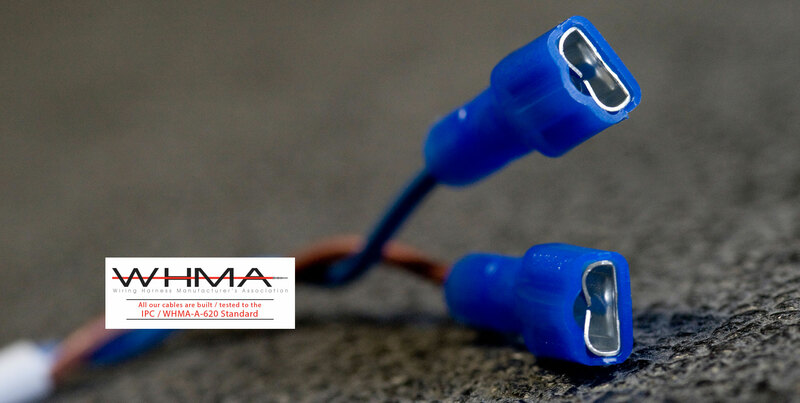 IPC/WHMA-A-620 describes acceptability criteria for crimped, mechanically secured, and soldered interconnections and the corresponding lacing/restraining criteria associated with cable and harness assemblies. Three classes of products are defined and each includes criteria for Target, Acceptable, Process Indicator and Defect conditions. IPC/WHMA-A-620 Class 1 products are suitable for applications where the major requirement is a function of the complete assembly. Examples include general electronic products such as consumer devices. IPC/WHMA-A-620 Class 2 products require continued performance and extended life. Uninterrupted service is desired, but not critical. Class 2 products include communications equipment and other dedicated-service electronic products. equipment must function when required. SHINE understands IPC/WHMA-A-620 and is certified to its requirements. To learn more about this important industry standard, contact SHINE.